With the Joint Summary Report now available for the two potential outer planet flagship missions, what can we now say about the potential for Io science with EJSM? While the length of the report does not permit a detailed description of Io science plans, the report provides a "finalized" version of the study team's concept for this mission, both in terms of mission design and payload and in science goals and objectives. To fill in some of the gaps in our knowledge, we can look at Ron Greeley's presentation at November's OPAG meeting. For a more detailed description of the EJSM team's plans for Io, we will have to wait until the more detailed JEO report is made available online. Understanding the Jovian satellite system, especially as a context for Europa and Ganymede. Characterizing processes in the Jovian magnetodisk/magnetosphere. Determining the interactions occurring in the Jovian system. EJSM will accomplish these goals at Io by performing three flybys of Io by the Jupiter Europa Orbiter (JEO) in the second half of 2026. An additional gravity assist flyby will be performed shortly before JOI with an altitude of 200 km, though the Summary Report states that this flyby is mostly for engineering purposes, so like the first Io flyby by Galileo in December 1995, little to no remote sensing is planned. During the other three encounters, performed in the second half of 2026, 20-30% of Io's surface would be imaged at better than 200 meters/pixel. 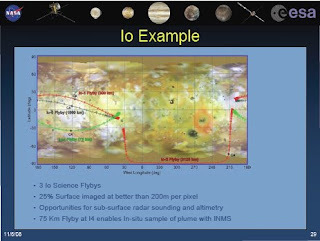 The last of the Io flybys is expected to have a close approach altitude of 75 km, close enough for JEO to sample Io's atmosphere and potentially a plume. The latter goal would require either targeting of the spacecraft trajectory so that it flys through a known plume, or for the spacecraft to serendipidously fly through one. The summary report states, "Flyby geometries are highly varied for latitude and lighting but are opportunistic as the trajectories are optimized for meeting the science requirements along with duration, delta-v and radiation dose." So targetting for a specific plume may not be possible. The current sample trajectory for the Io flybys would suggest a close approach on the last flyby near the volcano Malik Patera, where no plume has been observed to date, but a reddish deposit to its southeast suggests the potential for an intermittent one at least. It should be noted though that the encounter geometries shown in Greeley's presentation are just examples that are subject to change. During each encounter, JEO would collect 10-20 Gb of science data. The Summary Report stresses the potential for synergistic observations between the two mission components. For example, when JEO is encountering Io, the Jupiter Ganymede Orbiter (JGO) can observe Io from a distance, providing context for Io's global volcanic activity and the Io Plasma Torus. 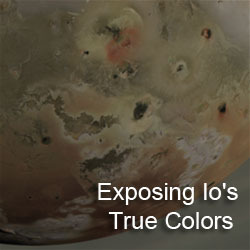 In addition, simultaneous observations by JEO and JGO at different viewing geometries can provide stereo observations of Io's volcanic plumes. Such observations could be useful with improving modelling of the three-dimensional shape of Io's plumes and the distribution of material in them. However, note that the JGO's model medium-angle camera would provide at best 162 km/pixel observations of Io from Ganymede's orbital distance. The two spacecraft can also provide more continuous high resolution monitoring of the moon's volcanic activity as the Summary Review seems to imply that the perijoves of the spacecraft would be staggered in time. While the two spacecraft flying in the Europa Jupiter System Mission have instrumentation designed to study Jupiter's icy satellites, nearly all can and will be used for Io science, both during encounters as well as during other opportunities in the Jovian tour phases of both spacecraft. The camera systems on JEO will allow the mission team to map 20-30% of Io's surface at better than 200 m/pixel. The three camera systems on JEO would allow to acquire WAC and MAC context imaging for NAC high-resolution images, a capability Galileo did not have which caused some problems interpreting some of that earlier probe's Io images. The Ion and Neutral Mass Spectrometer (INMS) would be used to determine the composition of Io's atmosphere and abundance of the various chemical species in it. 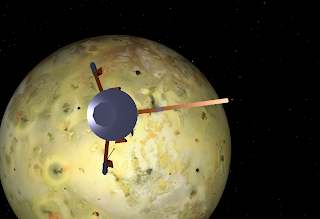 If JEO can be targeted to fly through a plume on the final Io flyby, INMS can be used to measure the composition of that plume, which can provide a strong constraint on the chemisty of Io's volcanic gases and vent temperature. The Visible-IR Spectrometer, which will cover a wavelength range between 400-5200 nm, would be used to monitor thermal activity on Io as well as observe Io's surface composition (making up for the stuck grating on NIMS during Galileo's Io flybys). 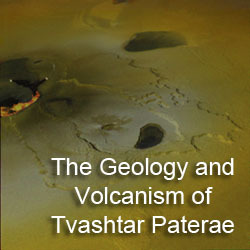 The Ice Penetrating Radar can be used to take a look at Io's near-surface structure. If the trajectory of JEO can be pointed just right, that data could help a lot in determining the formation mechanisms for mountains and paterae as well as determine the thickness of the surficial frost layers. The Ultraviolet Spectrometer can be used to study Io's atmosphere, aurorae, and the plasma torus. 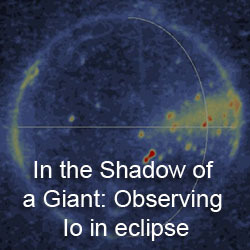 The laser altimeter could be used to measure the amplitude of the gravitational tides on Io. Finally, the thermal mapper can measure Io's mid-infrared thermal emission, which can be used to constrain tidal heating models. With JEO's flybys of Io and JGO's distant monitoring, the Europa Jupiter System Mission can further improve our picture of Io as it fits within the Jupiter system. While JEO will not provide the kind of detailed monitoring that the Io Volcano Observer could, EJSM would serve as a great follow-on mission from Galileo and hopefully, IVO, by both continued monitoring that could last for 2.5 years (with possible monitoring from Europa orbit as well) and by making use of instruments not available to earlier missions, such as the Sub-surface RADAR and Laser Altimeter.